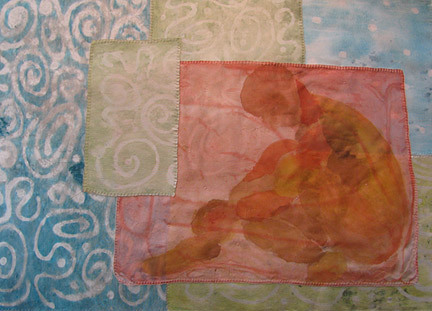 Last week I shared part one of my design process in creating this abstracted male figure quilt. This week I'm picking up with the construction process. 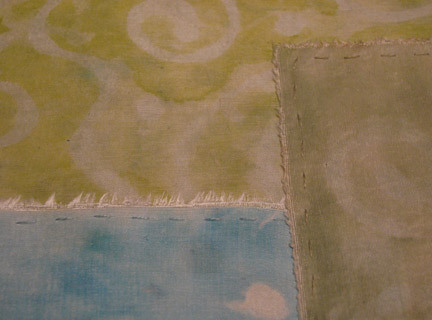 I began my hand stitching by attaching the background fabric pieces to the batting. The first ones I stitched were the pieces that would be underneath the sheer figure. He was painted onto a piece of China silk, and the rest of the background pieces are the heavier habotai and dupioni silk. 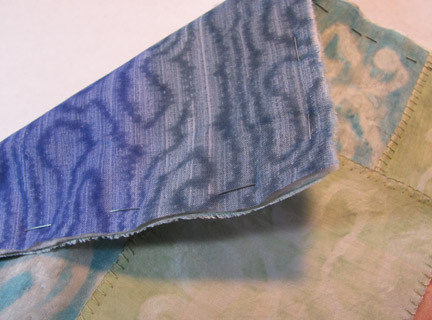 I used a simple running stitch in a floss color closely matched to the fabric so that it wouldn't show through the figure. 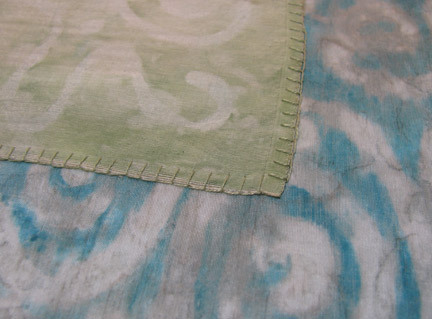 Pieces of background fabric that were not going to be hidden by the figure were stitched down using blanket stitch. I pinned the figure down on top of the background and stitched him into place, along with the piece of background fabric that overlapped him. 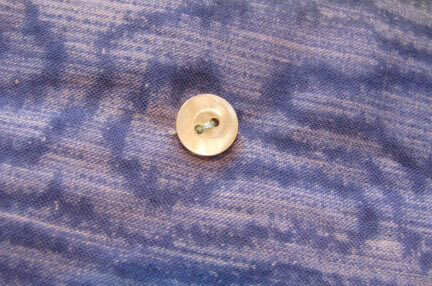 Again I used blanket stitch to attach a backing piece of fabric to the top and batting, trimming all the edges even. 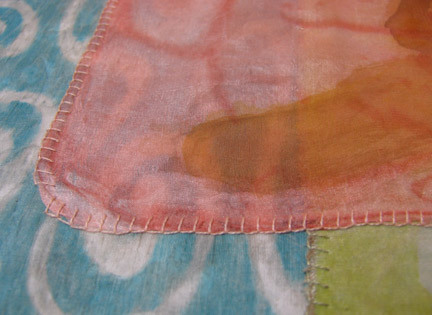 I chose four spots scattered throughout the quilt to add stabilizing buttons. These are buttons sewn to the back and up through all the layers in order to keep the quilt from sagging or shifting over the years. I try to pick spots to place them where the stitching will not show too much on the front, and always match the color of thread to the front, not the back. I love how this has turned out! You must be very pleased. Its artists like yourself who inspire the rest of us! LOL! You are very sweet :-) I am totally uninspired by my drawing skills (none), but one thing I really like about this piece is how you can see the patterns below through the figure. It's easier to see in person. I am in awe of your perfect stitching technique, Cyndi. Don't know how you keep the stitches so evenly spaced and the same length. You don't measure each one, do you?